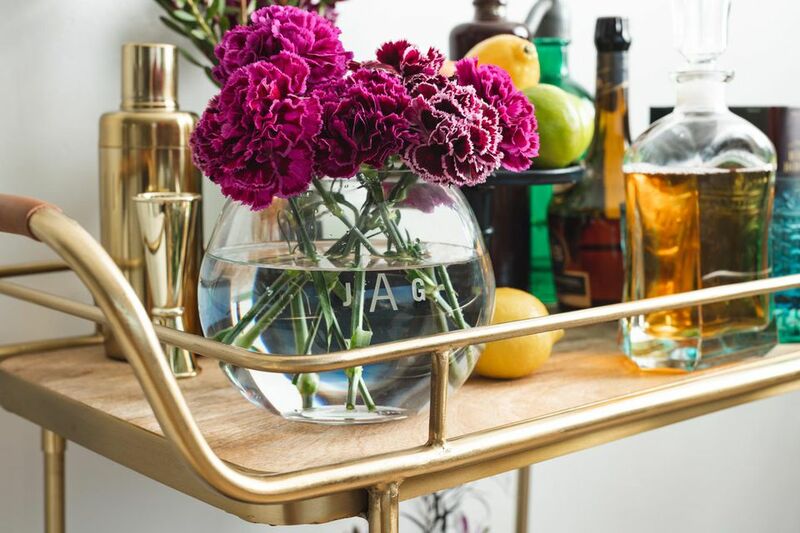 Bar carts are not only a useful piece of furniture for storing your cocktail essentials, but they have also become a trendy statement piece in home decor. No matter your decorating style, one of these DIY bar carts is sure to look perfect in your home—not to mention, your next gathering or party. Next time you visit a thrift store or garage sale, pick up an old suitcase and TV tray table. These are the supplies you'll need to create a super quick, temporary bar cart. If you have a small apartment, you can set up your suitcase bar cart for when you need it, and store it in a closet for when you don't. Or you can go the extra step and attach the suitcase directly to the stand to create an attractive piece of furniture to leave in your living room. Give a makeover to the old rusted vinyl record rack you have in your basement–with a bit of prep work and some metallic spray paint, you can cover up the rust and create a sophisticated bar cart. Do you have an old TV stand lying around the house? If so, you can repurpose it to become a beautiful ombre bar cart by using two colors of paint. As TV stands have plenty of storage, you can use the lower shelf to hold glassware and the top for bottles of alcohol. Repurpose an old metal rolling plant stand or office cart with a fresh coat of paint like Chelsea did from Lovely Indeed. It's the easiest DIY ever! IKEA's Bygel utility cart is a popular choice for bar cart makeovers. The affordable rolling cart with three narrow shelves is perfect for small spaces. 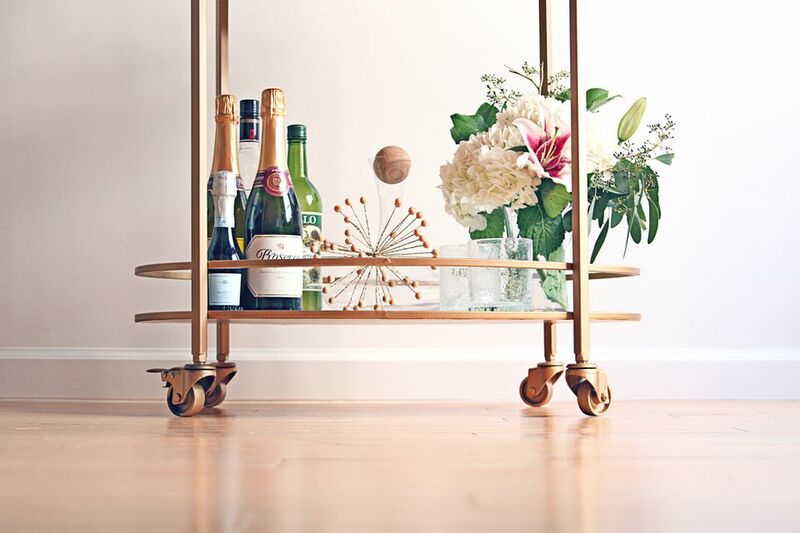 With a bit of gold paint and marble contact paper, you can update IKEA's storage shelves into a chic bar cart. Convert a vintage typewriter cart into a bar cart. The expandable top shelf is perfect to give you more counter space as needed. It's hard to believe, but this beautiful bar cart is made from an IKEA laptop desk! You can make this bar cart by adding a thick acrylic sheet shelf to the bottom of a Vittsjo desk and painting the frame. Skip the expensive purchase, and build a wood bar cart yourself like this one from Angela Marie Made. This DIY only costs $50 (vs. the potential $100+ you could spend buying one at the store). Restyle a vintage liquor cart with a quick paint job for this easy makeover from Elise and Emma over at A Beautiful Mess. Using only some primer and spray paint on an old cart, you can make this super fun DIY ​lime green bar cart for your home. Give a bar cart makeover to a traditional IKEA wood kitchen cart using paint and wood wax. With plenty of storage and solid counter space, this makeover is sure to become a frequently used piece of furniture. Craft a mixed metal bar cart for your home by hacking IKEA's Mulig shelving unit. Use stainless steel contact paper on the shelves and gold spray paint on the frame to give it a new chic look. Take a bland tea cart and enhance it with bright and bold colors to create a dramatic and fun bar cart for your home.